The Battle of Stalingrad is the single bloodiest battle in human history. Over the course of six months of non-stop, violent combat, a once sprawling industrial city is reduced into a shrapnel-riddled rubble, and over two million lives were lost. In the middle of this bloodied wasteland one man proved himself a hero in a scale as epic as the carnage that surrounds him -- a sergeant from an unknown village in Russia who almost single-handedly tipped the scales of the battle that changed the course of WWII in Europe. His name is Jacob Pavlov. Jacob Pavlov of the 42nd Regiment, 13th Guards Division, had been a proud yet regular farmer at the beginning of the war. But at Stalingrad, his iron-clad will, presence of mind and combat skills has altered the course of the battle and, with it, the course of World War II itself. On the afternoon of September 28, 1942, Sgt. 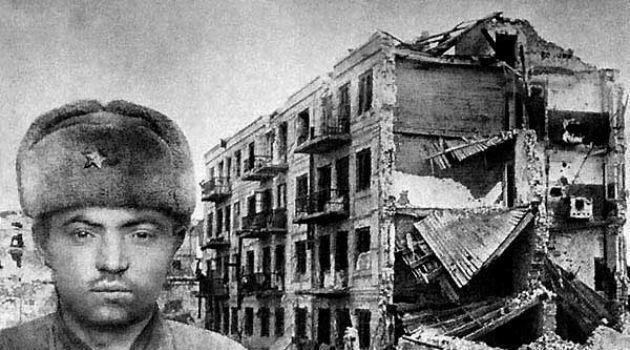 Pavlov was crouch-running his way across a snow-covered field towards an ordinary-looking four-story apartment building just on the end of Solechnaya Street, part of what used to be downtown Stalingrad. Aside from the fact that the building survived the bombing and wasn't turned into a pile of rubble as was the fate of the surrounding buildings, it was otherwise relatively unremarkable. 72 bullets whizzed through his helmet as Pavlov charged across the open field. He was returning fire with his PPSH machinegun all the while, too. Unfortunately, the German machine gun teams methodically gunned down Pavlov's squad one by one as they raced across the field. By the time Pavlov reached the apartment building, what remained of his 30-man platoon were himself and two other soldiers. This didn't faze him at all. He didn't race across a bullet-strewn field just to surrender to the enemy. By virtue of the fact that he was the only non-commissioned officer that wasn't either dead or fatally wounded, he was now the senior ranking member of his unit. He ordered his two other men to sweep the building while he gave first aid to the wounded Russian POWs and civilians he found inside. He then organized a defensive position, set his men on watch for counterattacks, and was firmly in control of a small and crumbling apartment building 200 meters on the German side of the Volga River. His orders were simple - DO NOT LET THE GERMANS TAKE THE STRUCTURE. DO NOT LET THEM REACH THE RIVER. HOLD UNTIL DEATH. KEEP HOLDING AFTER DEATH, IF POSSIBLE. After a long night of fighting off enemy attacks, Pavlov's platoon was reinforced to twenty-five men the next morning. 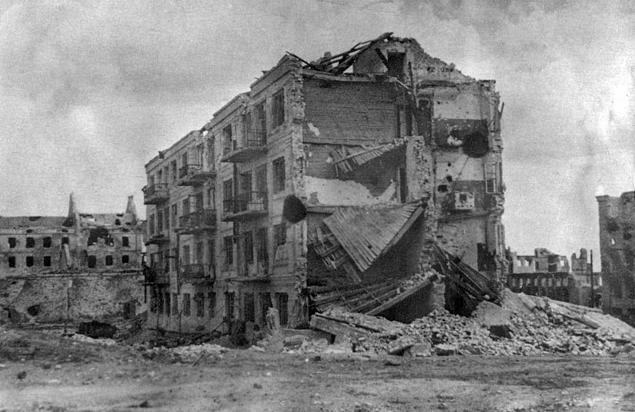 There were also about a dozen women trapped in the building, and Pavlov used everyone in the building, soldiers and civilians alike, to turn the crumbling building into a fortress. Within a few hours, every approach to the building was cleared of debris, rigged with land mines, and redecorated with thousands of feet of barbed wires. Every window was sandbagged and stocked with enough weapons and ammunition. The men cut a glory hole in the wall just big enough to fit the barrel of the machine gun through. They ripped out the middle of the building's interior so that they could throw weapons and ammo back and forth to one another even if they were on different floors. The platoon also dug a ten-foot deep communication trench back to the Volga, which allowed them to sneak a wheeled anti-tank artillery piece into the basement of the building. The trench was also used to ferry food, ammunitions and medical supplies from the Russian lines in the River to Pavlov's fortress. By the time they were done, the once crumbling building became a sort of place that would have withstood the zombie apocalypse. Despite having full regiments of German infantry charging the apartment building unrelentlessly day and night, Seargeant Pavlov tirelessly urged his men to hold out. During the day, repairs to the structure were made, and at night the tracer fire poured out by the 25 men in the fortress was so intense that their building becomes visible across the entire battlefront -- standing like a beacon of heroic resistance against the Nazis, and a detail that earned Pavlov the Code Name LIGHTHOUSE. The Germans kept hurling everything at the building, but for some ungodly reason they just couldn't take the apartment and its men down. They also couldn't just leave the building alone and just chill as Pavlov held the main road approach to Volga and the Germans know they couldn't win the battle without crossing the river. So they keep throwing guys at him and Pavlov and his team kept killing them all. Pavlov also personally goes out on the roof with a pair of binoculars, sending coordinates to Soviet artillery guns, which in turn rained death down on the Nazi positions. At one point the German got so fed up that they called in a full Panzer Division, rolled their tanks so close to the building that they basically rammed their gun barrels trough the window and shot point blank into the living room. But even this miserably failed. Pavlov saw into their moves and had already cleared out the main floors and moved his anti-tank weaponry into the basement where they blasted straight through the floor armor of the tanks and blew everyone inside. The panzers held in reserve were then shot through the thin armor at the top of their turrets as marksmen on the roof armed with PTRS anti-tank rifles blasted a few dozen rounds down from the roof, through the Nazi tank commanders, and right into the hull. By the time the Panzers figured out how they were getting blown up, they were already too close to the structure, and they couldn't raise their turret guns high enough to shoot back. Just keeping this daily regime of Nazi-capping insanity up for a couple days is impressive, but for TWO FULL MONTHS the men of the 42nd Regiment, 13th Guards Rifle Division held their ground. The soldiers inside represented eight ethnicities from across the Soviet Union – Russian, Kazakh, Georgian, Uzbek, Tajik, Ukrainian, Jewish and Mongolian – and with every man wounded and exhausted, and the building crumbling around them from the constant mortar, artillery, and machine gun fire hammered it nonstop, these guys resolutely fought on against all odds. Jacob Pavlov, for his part, never seemed to lose his sunny, ever-cheery disposition, and even though this guy was a low-level sergeant he not only inspired his own beleaguered unit, but the entire Red Army – his balls-out defense was a propaganda-machine-fueled beacon of heroism amid a war that laid carnage through Warsaw to Moscow. Always looking for ways to improve morale, during the defense Pavlov found an old phonograph machine in a blown-out apartment – it only had a single record, and nobody knew the tune, but he and his troops played that song until they'd memorized every note. As the most ferocious battle of World War II raged around them, men fighting street-to-street and house-to-house, the Nazi onslaught continued on this makeshift fortress. Pavlov's men constantly cranked machine gun fire in every direction, and while the Germans were well-known for their strategic blitzkrieging abilities, towards the end of the battle for Pavlov's Apartment the desperate German commander of the Sixth Army threw all that tactical training away and he simply hurled wave after wave of his own men at the Russians. It allegedly got to such a point that during breaks in the fighting the Russians had to run out of the house and kick over piles of bodies just so that they'd have clear firing lanes towards the enemy. Before long the place was covered with so many skulls and bones. Jacob Pavlov's troops held the position for an unbelievable fifty-nine days. By that point the Battle for Stalingrad was nearly decided – Pavlov and the other defenders of this vital city had held long enough for a fresh Soviet army group to arrive from Siberia, encircle the German Sixth army and utterly annihilate it where it stood. The defense of Stalingrad proved to be the turning point of World War II – the back of the Nazi invasion of Russia had been broken, and from that point on the Germans would be on the defensive as they retreated all the way back to Berlin. And, in the middle of all of this, for two months, one sergeant had held the high-water mark of the German invasion of Russia. The Fascists never advanced past him, never took the building , and never overran his position, despite outnumbering his force by a factor of about a hundred thousand to one. Sergeant Jacob Pavlov survived the battle, fought through the rest of the war, was present during the fall of Berlin, and was awarded the title Hero of the Soviet Union, the country's highest honor for military bravery. The building he defended is still standing today and is a national landmark in Russia. But, despite all that, the greatest testament to Pavlov's defense is this – when the Russians captured the Sixth Army, they noticed that German commander General Friedrich von Paulus' personal map of the battlefield had the structure circled in red and with the hand-written word "Castle" next to it. The Russians maps had simply labeled it "Pavlov's House."